For the Love of Vegetables! Weight making does funny things to the brain. I consider myself lucky. My body has always responded incredibly well to the tweaks I make in my diet in order to make weight for racing. It requires diligence and focus for sure, but I’ve never had to do anything extreme. And yet, at the end of every season, I go through a period of time of just wanting to eat, well… everything! Days 1 and 2 after racing and weigh-ins are done: You eat everything (literally) but don’t actually taste anything. You overindulge and it’s fun because you’re free – free! – of any impending weigh-ins. You love the actual eating but don’t actually enjoy the food. Days 3 through let’s say 7-10: You’ve adjusted to eating like a human again and can now sit down to a meal and savor it! These are the best days. I’m usually looking to gain some weight post-season so it’s a great time of year to go out at your leisure (breakfast, lunch and dinner – sure, why not?!) and order off the menu without much care. If you’re scratching your head wondering what I mean by “eating like a human again,” here’s some context: During the days leading up to a regatta and the regatta week itself, many lightweights including myself will modify their diets in order to “lose” the final few pounds to make weight. This doesn’t necessarily mean restricting calories. Instead, you’re swapping dense, fiber-packed food for easily digestible food like white rice, bananas, honey and eggs. Personally, I eat a lot of oatmeal, a lot of eggs, and frankly a lot of ice cream if I need to keep my calories high. Variety is minimal. By the time race week is done, I’m usually craving a burger and fries because that’s my go-to indulgence of choice, and also a salad loaded with veggies because I’m dying for a taste and texture that’s not oats! Days 10+: This is where things get tricky. While I may want veggies in the immediate wake of a race week, I also crave plenty of treats! Treats are a slippery slope, as is going out to eating and simply not being mindful of what you put into your body for fuel. For me, the result is always a steady decline in preparing and eating fresh food at home, and a corresponding rise in indulging at restaurants or grabbing snacks and meals on-the-go. To some extent, this is just another part of the cycle of the year. Even without going into big caloric deficits during the season, I need the mental break from all the food prep and planning, and thoroughly enjoy going out with my family and friends. However, transitioning back to healthy habits is hard! And that’s exactly where I’m at right now… swapping the easy options for the healthier ones that usually require a little more thought, effort and time. For example, going home after practice to make breakfast instead of stopping at Starbucks, choosing something more nutrient dense than a peanut butter sandwich for lunch, and cooking fresh food for dinner instead of ordering out. 1) Make one small change at a time. For example, make a big salad for dinner instead of picking up takeout. 2) Eat something green at least once a day. Think vegetable here. In other words, something green that’s fresh and comes from the earth. Green. Once a day – that’s it! 3) Remember your motivation. This can actually apply to establishing any new habit. Remember your motivation (repeat it to yourself ad nauseam, if needed), and also keep in mind the consequences of not doing whatever it is you want to achieve. In terms of clean eating, I actually take rowing and weight completely out of the equation at this time of year. Energy levels and mood drive my food choices. Nourishing food means a good mood, better sleep and more consistent energy levels throughout the day. Suboptimal choices mean poor sleep, poor recovery and feeling tired, foggy and just plain down. Today I will love myself enough to… eat fresh vegetables and other nourishing food. Today I will love myself enough to… cook at home instead of going out for a meal. Today I will love myself enough to… take a walk after dinner. Today I will love myself enough to… stretch. Today I will love myself enough to… read something fun before bed. 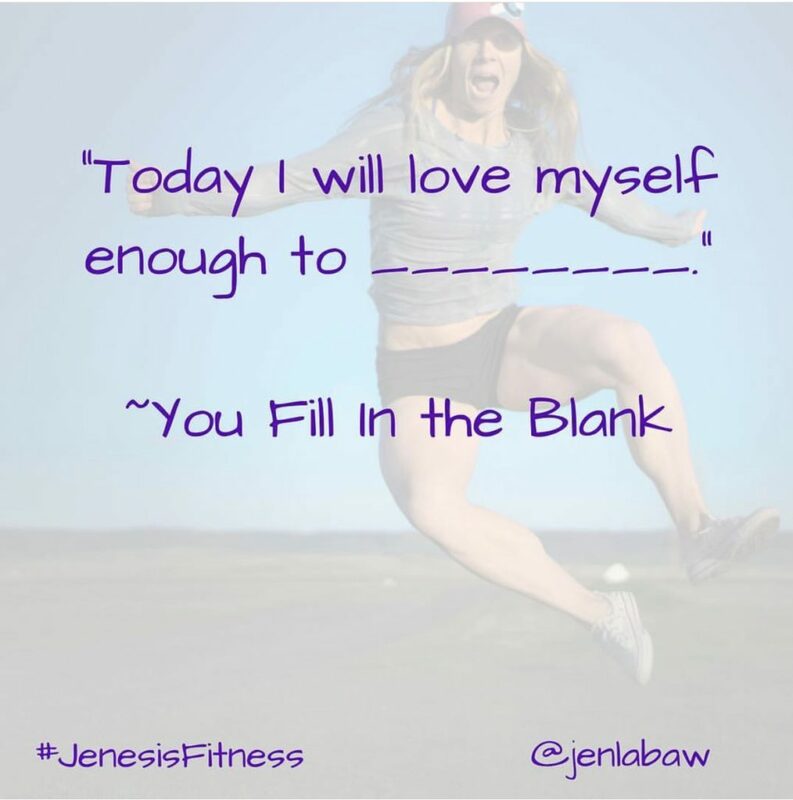 Today I will love myself enough to… your turn… GO! 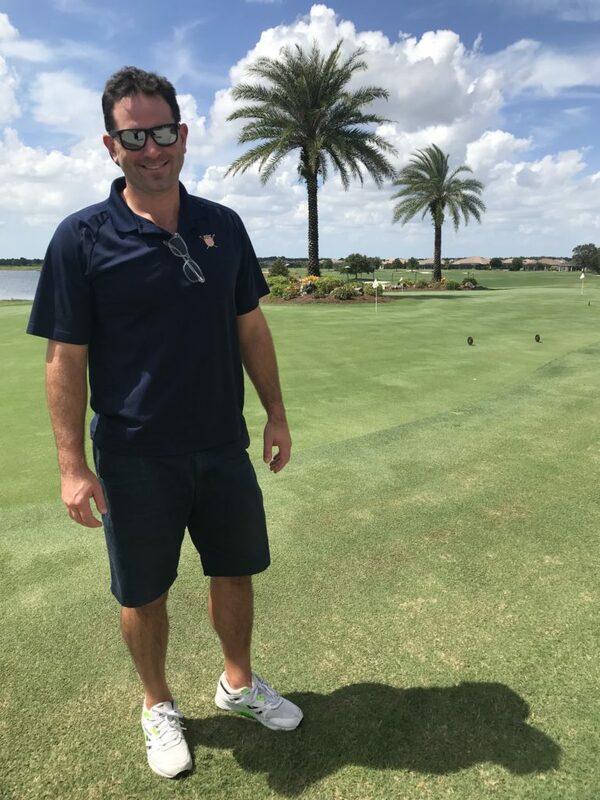 With my coach away at World Championships last month and me craving a change of pace from home, we decided that I’d head down to Florida to start off the fall. So far, it’s been a wonderful mix of homesick, fun and hard work. The training’s been great, which is ultimately why I’m here. 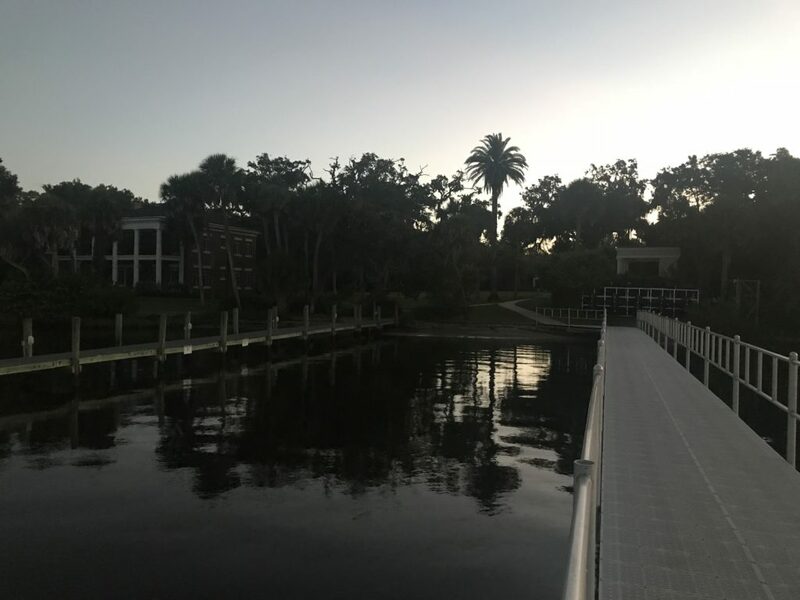 I’m challenging myself with a new group of athletes, while rebuilding mileage, getting back into the weight room and acclimating to the seriously intense Florida heat! With the World Rowing Masters Regatta in town, we’re training out of “the site” in Osprey, a town just south of Sarasota. 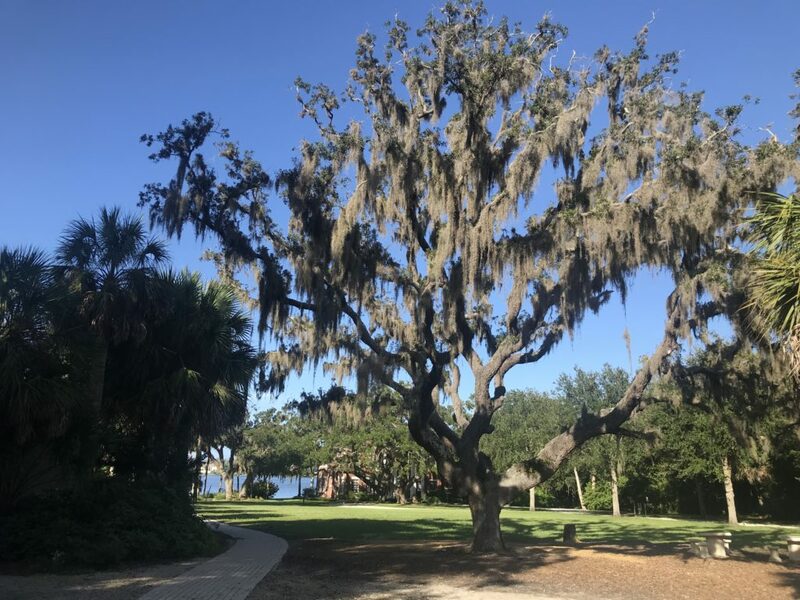 The site is located on the grounds of Historic Spanish Point, which is an outdoor museum and gardens. It’s gorgeous! I was here for a few land workouts in May but never took the time to learn about it. So, I did some research and found out that Historic Spanish Point is one of the largest intact actively preserved archeological sites of the prehistoric period on the gulf coast of Florida. 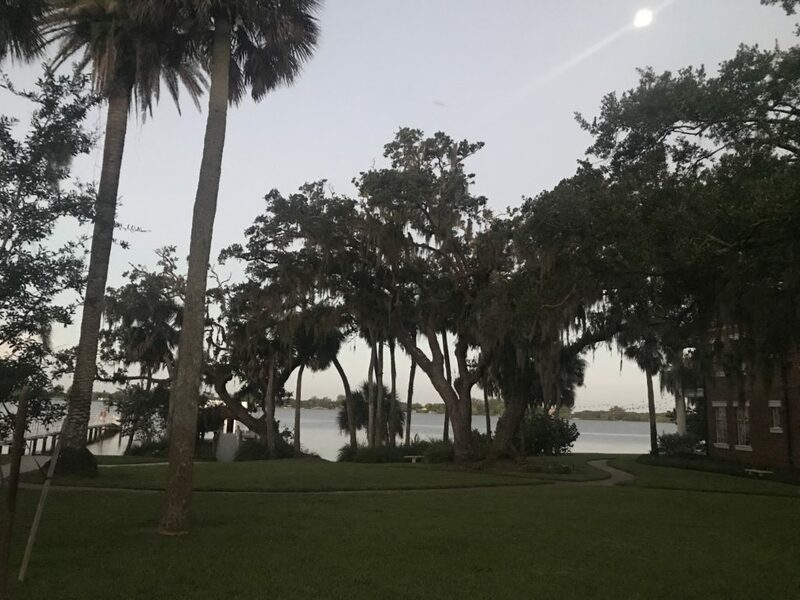 Records show that it was first inhabited in 1867 when John Greene Webb and his family moved from Utica, N.Y., and established a homestead on the shores of Little Sarasota Bay. 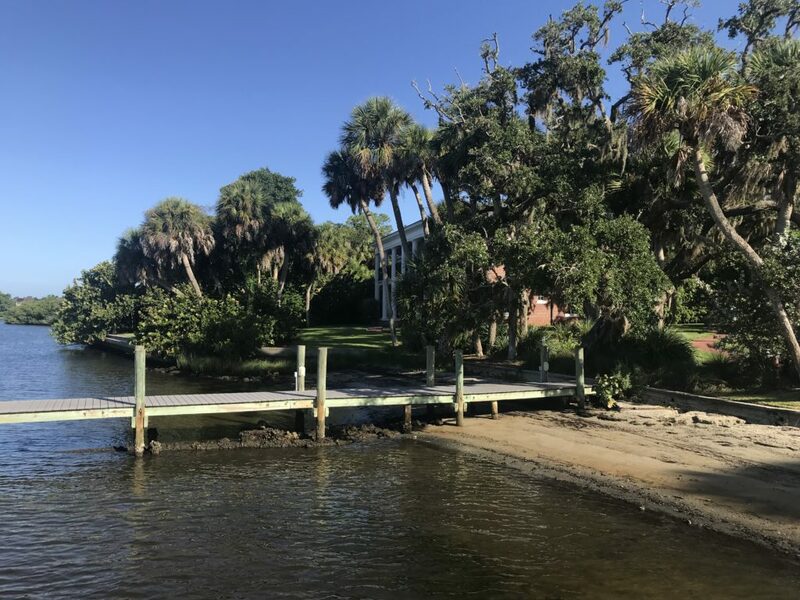 Today, you can visit Historic Spanish Point and attend art history lunches, archeology lectures, and boat and walking tours. It also hosts events like the Halloween Ghost Tour, which is coming up next month, and can be rented for weddings and other occasions. 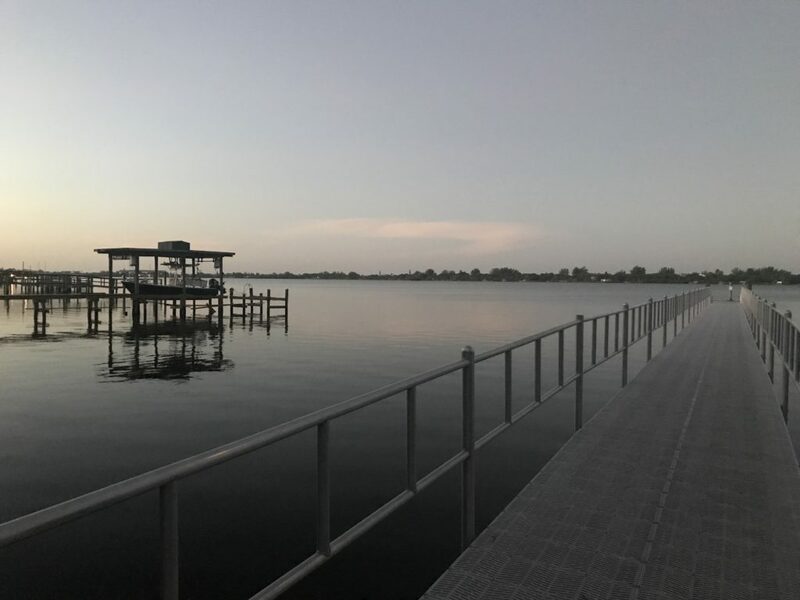 We row in Little Sarasota Bay and generally head north when we launch, which takes us into Siesta Key. I was worried about the recreational motorboats when we first moved from Benderson but so far so good. 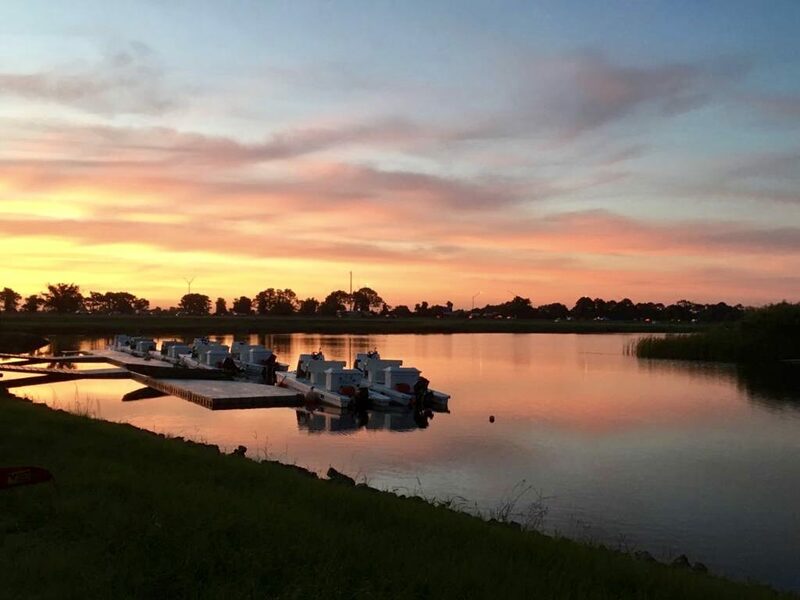 We arrive at 6:30 and launch at 7 AM, using the 30 minutes to do all the typical pre-practice stuff like getting our boats ready, and bringing our oars and other gear to the dock. I love this time. The bay is quiet and peaceful, and looked absolutely gorgeous under the light of the full moon last week. Sunrise is just after 7 so we’re launching just as the sun comes up. It’s truly impossible not to wonder at the stillness, beauty and space. Looking out toward the bay before practice. 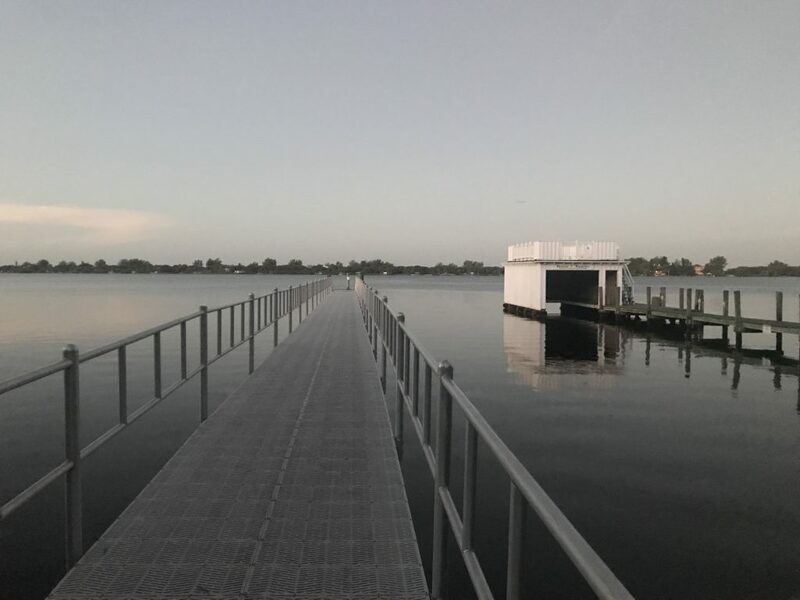 A closer shot of the water and the dock where we launch. It’s a LONG walk! View to the north, toward Siesta Key. View to the south, toward Casey Key and Venice Beach. 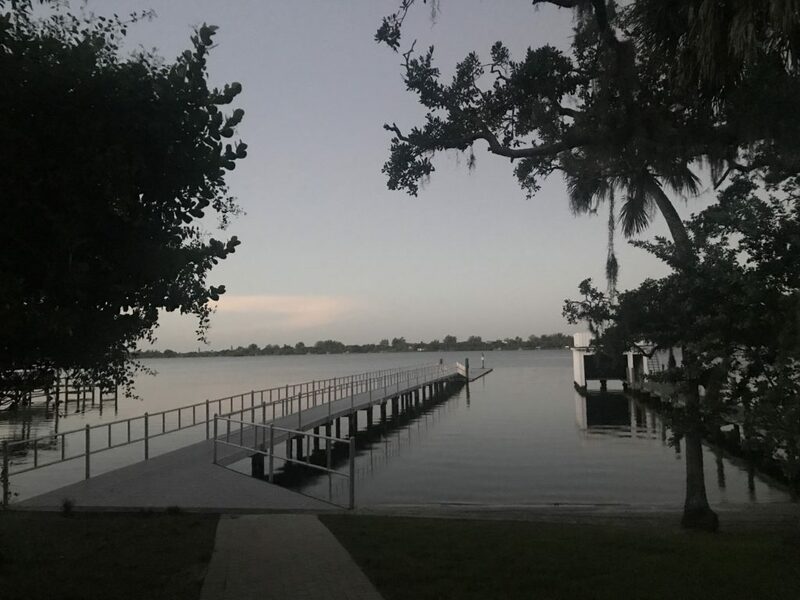 View of the launch site from the dock. It’s dark when we arrive, and also peaceful, quiet and serene. 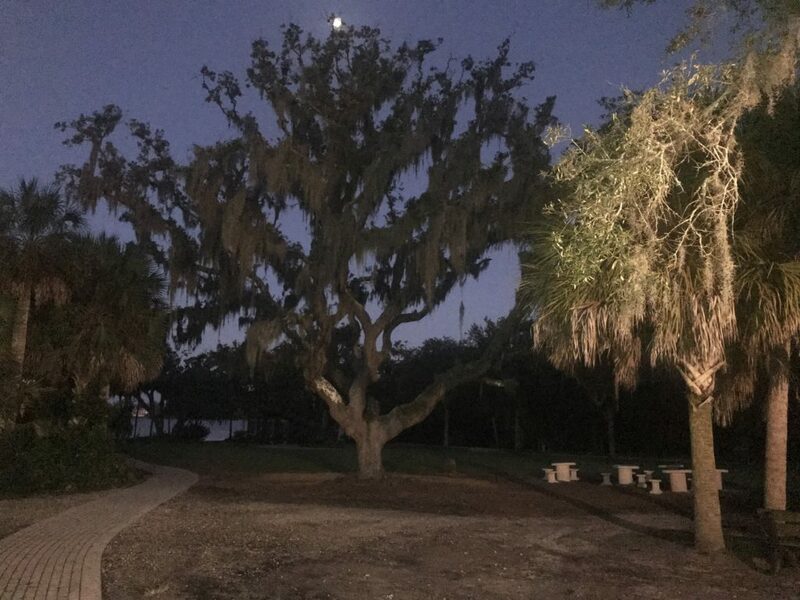 Gorgeous Spanish moss tree at the launch site. 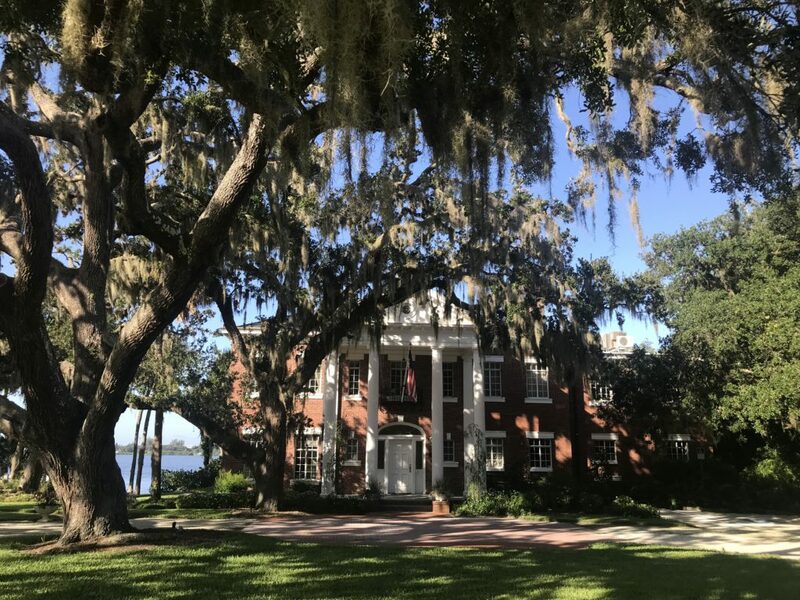 One of the buildings on the grounds of Historic Spanish Point. 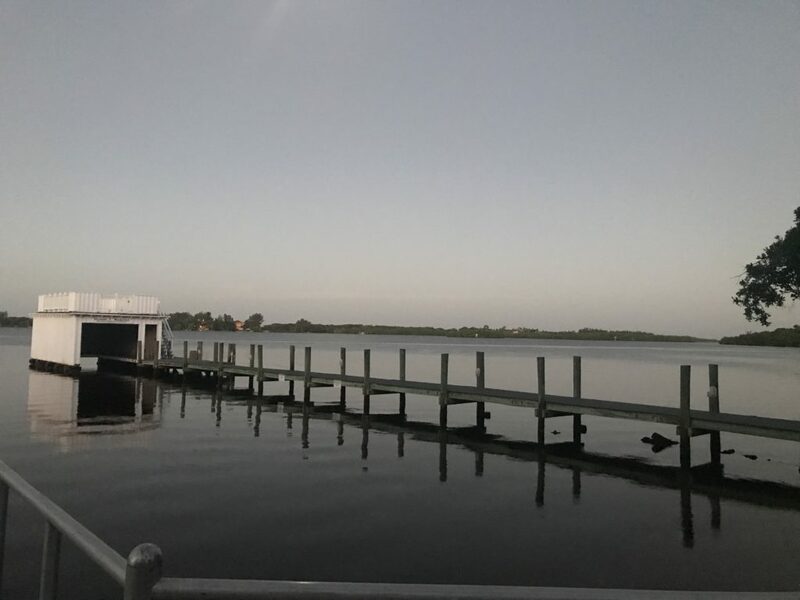 Little Sarasota Bay is in the background. Palm trees and more Spanish moss. I took this after practice, walking my oars in from the dock. Last but not least, Sarasota! Arriving at Benderson after the two-day trip from home. Within minutes of unloading and getting ready to rig – nuts and bolts all completely disassembled in the tracks – the sky went dark, the wind picked up and it POURED! Impeccable timing. First morning on the water at Benderson. The sky was LIT UP! As always, happy rowing, my friends! Sending out fast vibes, and wishes for strong bodies and mental stamina as we dive into the fall season. Many thanks for reading. LOVE THIS POST!!! So many good things! Thanks, Jess! Thanks for reading. 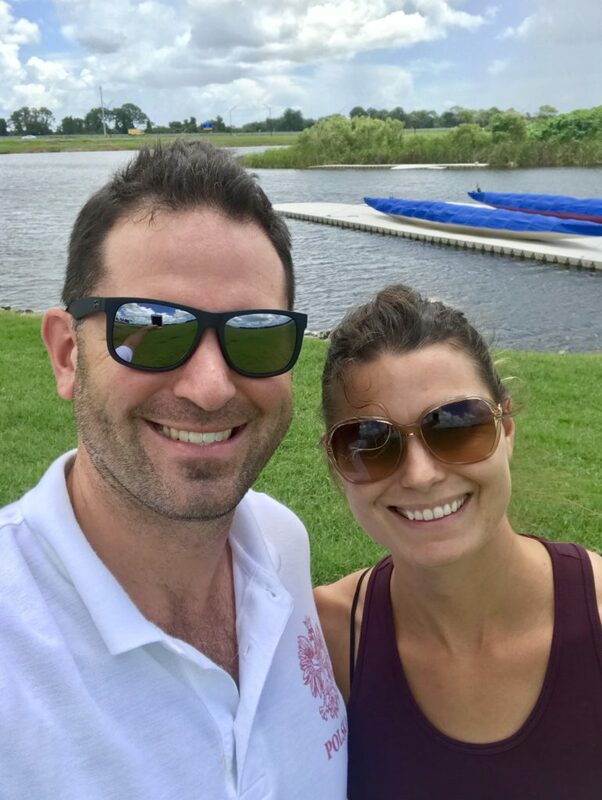 It was fun to find out a little bit more about where we’re rowing!